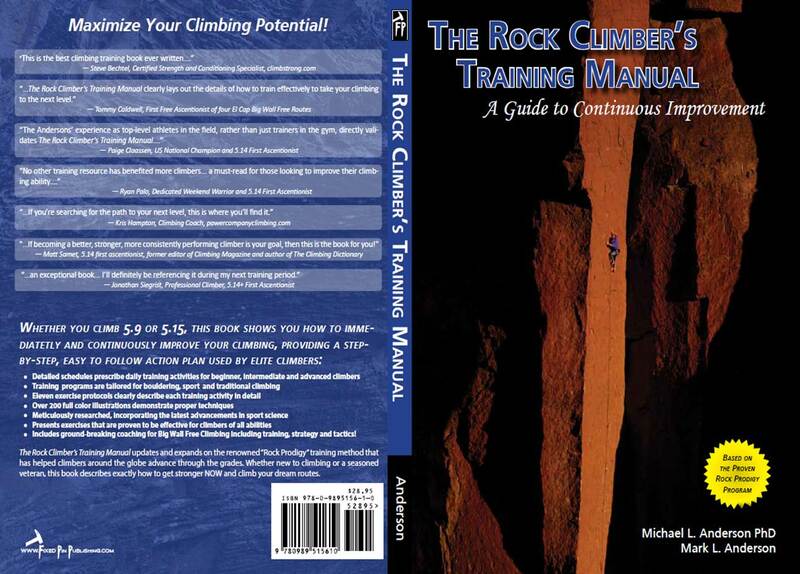 The Rock Climber’s Training Manual is now available order yours here! Welcome to the Rock Climber’s Training Manual.com! The Rock Climber’s Training Manual is an all-new, comprehensive guide to continuous climbing improvement. On this site, we’ll provide expanded multi-media content that enhances the book. This is also a venue for you to participate in the conversation by offering questions, suggestions, testimonials and by providing your own content. The Rock Climber’s Training Manual describes a training method that has become known as “The Rock Prodigy Method”. This method was originally developed by Mike Anderson in the late 1990s, based on Udo Neumann and Dale Goddard’s book Performance Rock Climbing and Petro and Yaniro’s training video Fingers of Steel. Since that time, the program has evolved substantially to incorporate advances in sport science, personal experimentation, years of experience, and to broaden the applicability to climbers in different stages of development. The Rock Prodigy training method is a form of periodization —- a strategy for physical training in which exercises are carefully varied to avoid plateaus and create synergies that result in a performance peak at a predictable time. Climbing requires diverse fitness. For example, power to execute extremely difficult single moves, along with endurance to sustain such moves. Through careful timing, the periodization of the Rock Prodigy method enables climbers to simultaneously develop a high level of each aspect of fitness. The combined effect is the performance peak: a temporary, but significant boost in climbing fitness that will enable the climber to attain never-before-seen levels of performance (read more on the Building a Training Plan page). 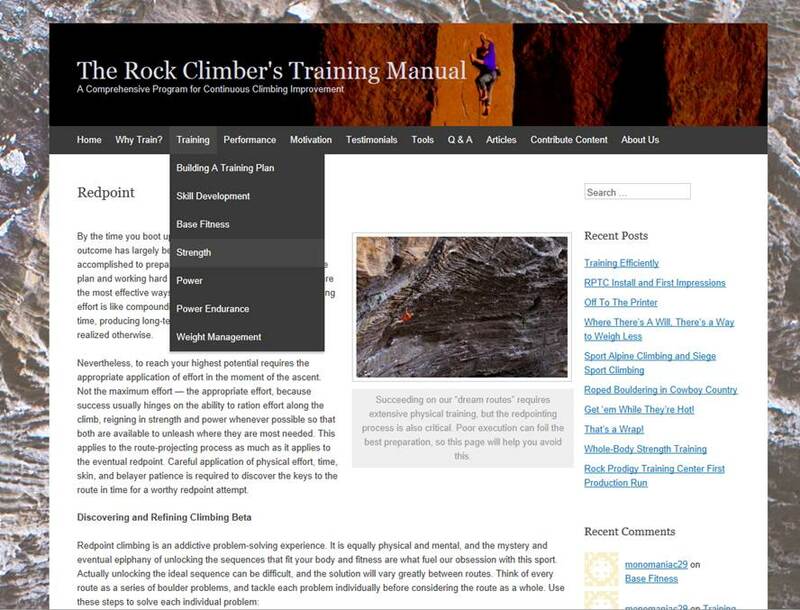 The Rock Climber’s Training Manual and RCTM.com are about more than just training. While preparation is essential, climbing is a performance sport. At the end of the day, what matters most is that you achieve improved performance on the rock. These resources will help you learn how to select inspiring goals, how to tailor your preparation accordingly, and how to maximize your performance on the sharp end, so you can make your climbing dreams a reality. For more information about the Rock Prodigy Training Program, download this free PDF: Introduction to the Rock Prodigy Program PDF. These topics reflect those presented in the book, but each page on the site contains several additional articles on training for climbing that are related to that topic. An index of all of the site’s articles can be found on the Articles page. International distribution is still in-work, so I don;t know where it will be available yet. Wehn we have information on international distribution we will post an announcement. At this time there is no plan to create an e-book. I just received your training book and I’m starting to put together my plan for the year. I have climbed probably 10 or so 12a/b’s in the past two years but decided to ski rather than train for climbing this winter. Now I’m struggling on easy 5.11. When picking appropriate workouts (hangboard, etc) would you advise going for the beginner workouts or intermediate first? Or starting w the beginner workouts and then transitioning to intermediate? Thanks so much, I’m excited to get started! It sounds like you are probably ready for the Intermediate Hangboard workout. As for the other routines, it really depends on your experience level with those exercises. If you’ve never campused before, start with the Beginner routine and stick with it until you can do all the exercises, then transition to the Intermediate routine. Just recieved your book here in the uk and havent had the chance to get round to fully reading it but from what i have scanned it looks very helpful not only for my own climbing but helping with my personal coachin of other climbers. Also would like to say thanks for the note inside it was a nice touch. My question is i dont really have a suitable place to hang my fingerboard due to not owning my own house and my climbing wall doesnt have one in place, what is the best way to be able to set one up? Hey guys the book is great! I am just about to dive into the training with a bouldering specific calendar, and was just wondering if outdoor mileage would just be suplemented with more ARC training because I don’t have any outdoor climbing near me. So all my outdoor climbing are trips. I’d like to get a copy of your book, but living in Germany (right in the middle of the frankenjura😜), the shipping costs are pretty high. Is it possible to get your book as an eBook, or do you know a shop in europe that sells it online? There is no e-Book. I’m told there is a gym in the Netherlands that will ship the book. If you search around our forum you can find the details. Also Amazon.UK has copies occasionally. Is there a French translation of the manual ? I am a French English teacher, I would love to translate your book if you are interested, let me know! Je ne connais pas du tout le procédé de ce service. Il y a t il un prix au mot å la page au livre? Je serais intéressé de savoir le prix de la traduction . Je vous laisse mon mail pour échanger librement. hi are there any distributors of your book in Singapore or Malaysia? Colin, unfortunately, no the book is not distributed in Asia, but you can order it from our website. I am Fede, a spanish engineer and climber living in the UK. I think your book is a superb tool for any climber wanting to improve and I would like to offer myself to help with the translation to spanish in case you consider it any time. Thanks for your contribution to this world! I am Renjith from Kerala, India. A software engineer by profession. I am passionate about learning rock climbing, but not sure where to start. Please advice. I would recommend finding a qualified guide in your area to take you out for a day and see how you like. A good guide can also teach you some basic skills and help you get started on the right path. I was at turkey rocks the day you fell and broke your back (I drove your wife and kid to the hospital, send my regards). I didn’t really know about your climbing accomplishments or training contributions at the time, but have read up on it more recently and just ordered your book. It’s cool to see you are still climbing strong and thanks for all that you’ve done to help educate us lazy climbers on how to get better without just getting injured. I’m excited to start a more long-term approach to training with the help of your book. Thanks for the note, and thanks for your help that day! It was very frightening for me and my family, but I’ve turned it into a positive, and I’m climbing better than ever, and loving life! I’ve started my ARC training, going well. I was wondering if you have a digital version of your training logs, it would really help me keep track of my seasons. You have shown excel data in the past and I was just wondering how you set it up. We have a download-able Excel training calendar on our downloads page (hover over “Tools” in the menu bar). For the actual individual workout logs, we only have the hard-copy logbooks, but I’m sure you can recreate them fairly easily (they were created with Excel). We have similar devices over here (which is most commonly referred to as a “treadwall”). Treadwalls are great for ARC training! Is this only available in a paperback, or is it available for lets say… Like a kindle or a pdf /document that it can be read on like a tablet? Just purchased your book and the Trango rock prodigy. Former 5.12+ climber starting over basically and living in North Idaho, not much chance to get outside and do routes for the first phase Basic Fitness this time of year. Not having easy access to a gym, is there any way to replicate that phase either on the rock prodigy or with weights so I can best be prepared for the Strength phase? Book is amazing quality, it’s pretty inspiring to see cutting edge physiological science applied to climbing considering the lack of the same 20 years ago. It is possible to ARC on a hangboard. It’s not very fun, and you will miss out on the technical benefits, but its better than nothing. The best way to do it is to build a Kick Plate with small footholds below your hangboard. There is a photo of a kickplate and discussion in the book (I think Chapter 3, but I’m not sure). I’ve gone through four cycles of training in the last year using the RP book. In ten years of mostly trad climbing, this was the first time that I took training seriously and gave it all I had. Before training, I would tick off low twelves pretty quick, project 12c (and one time I managed to send a 13a with a stupid amount of effort). After this year of training I climbed 25 5.12s, five 5.13s, including a 13a flash, two 13Bs, and I’m one move away from a 13c, all of which has totally blown my mind and made being a rock climber feel even more like having a super power. I owe a lot of that to you guys—so thank you! I’m about to start a new season of training (hopefully after I send Insider Trading in Socorro on Thursday (last try, I think)) and I had a couple questions. I’ve been listening to a lot of podcasts and reading a lot of other books about how to train (mostly about periodization vs not, max weights vs. the 7 second-3 second thing, one arm bent at 90 degrees vs. two arms extended, etc.) With all these smart folk saying different things, I don’t know whether to continue to the RP method exactly the same or whether certain elements have changed, while the greater idea stays the same?? Would it be worth it at this point for me to experiment with new things or should I keep at it, since it seems to be working. Also, on my last cycle, I got to +50lbs on my ring-middle hangs and, while I could do it, I felt tweaky for a couple weeks after the strength phase which prevented me from climbing for a couple weeks. Does that mean that it’s time to go to the smaller 2FP with less weight for this go around? Sorry, I know that’s a lot of questions that I’m sure you have already answered elsewhere. The training thing is still relatively new to me, and I want to do it right. Thanks! Wow! Those are some impressive results! If I found a training program that produced such amazing results, I’d probably stick with it until it stopped working. But you make a great point, there are many sources of training advice and its hard to know what to believe. Personally, I recommend that you follow the results. Those who know their stuff are producing consistent results, either on themselves or on athletes they train exclusively. It really is that simple. Regarding the MR hangs, it sounds like you’re being a bit too aggressive with your progress if its forcing you to take time off. Try to limit the resistance to whatever you can handle “safely”. It may be a good time to down-size your MR grip, but it really depends more on the type of climbing you do. If your typical goal route involves 2-pad-deep pockets, then you should train on 2-pad-deep pockets, etc.